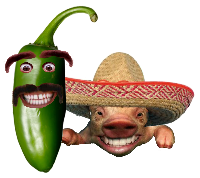 Wash and slice the Jalapeno peppers in half. Remove the seeds and drop in a few slices of green onion. 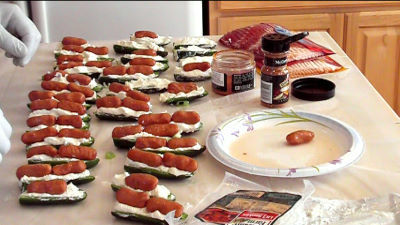 Fill the pepper with cream cheese so its mounding up a bit. Wash and slice the chicken breast into thin strips and cut them in half. Season the chicken with the dry rub and the garlic onion mix. Season the top of the cream cheese with the garlic and onion mix. 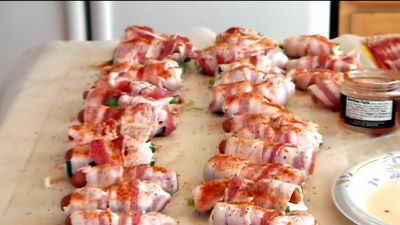 Press two little smokies into the cream cheese on each pepper then wrap with a single thin slice of bacon. 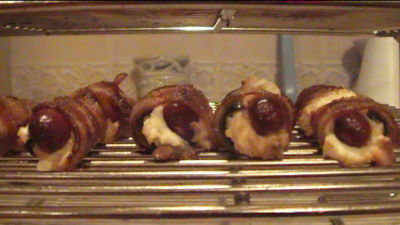 Don't wrap too tightly as the bacon will shrink and start to squeeze out the cream cheese. 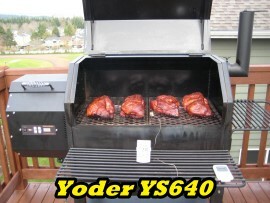 Smoke low and slow @ 225 degrees until the bacon is cooked to desired liking. Remove and plate up. They won't last long at parties and family get together. The flavor and taste is simply put... Amazing!